There are as many reasons for buying art, collecting objects or commissioning sculpture as there are people who do it. Sometimes someone falls in love with a sculpture because it evokes a memory, other times because the shape, texture, or colour are irresistible. On occasion it is hard to put into words why a particular artwork strikes at your core and you feel compelled to have it as your own. I know this feeling and of having walked away from a piece that has ‘spoken’ to me, and later felt a sort of loss and regret. As a sculptor I’m very happy to have been part of such stories, where something I’ve carved, made, crafted, sculpted becomes meaningful to someone else. It is a marvel of human communication. Actually I see it as a little miracle, and without doubt inspires more making. 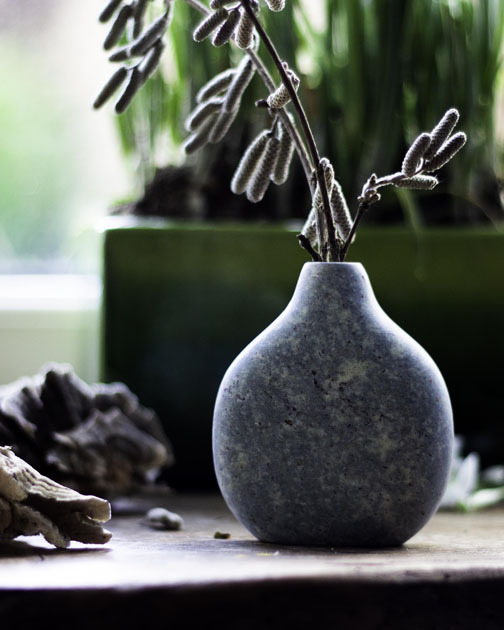 Just the other day I was contacted by Jane Lindsey of Snapdragon who purchased the little vase in the image – this very simple stone has been elevated by her beautiful story. The vase has become a symbol expressing a moment of huge decision in her business, becoming a mark, a visible, tangible representation of her feeling at the time. Just look how proud the stone vase looks, holding with assurance all it now knows, and the gorgeous catkins. one year at our open house a woman came early on the first day to purchase a piece that she had seen the previous year and didn’t buy and regretted it all year. it is so gratifying when that happens. I did still have the piece and she did buy it. That’s such a lovely story Ellen, and how lovely that she returned, and that she was able to take her loved piece home – and I bet it is extra special to her.